LONDON, England (CNN) -- A British adventurer has overcome sea sickness to complete his around the world trip relying only on the goodwill of people using social networking site Twitter. 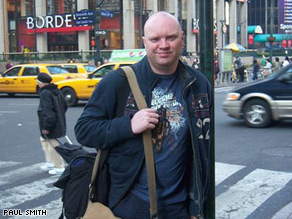 Paul Smith poses in New York in a picture posted on his Flickr page. Paul Smith aimed to travel to Campbell Island in New Zealand, the opposite side of the planet to his home in Newcastle-upon-Tyne, in 30 days. In the end he fell just short -- reaching Stewart Island at the foot of New Zealand's South Island. There was not another boat to the more southerly Campbell Island -- a UNESCO World Heritage site -- until November. During his trip Smith visited the Netherlands, France, Germany and the U.S. -- where he was given a free flight to New Zealand -- and had his photo taken with Hollywood actress Liv Tyler. His self-imposed golden rule was that he could only accept offers of travel and accommodation from people who use Twitter, a micro-blogging service that allows people to "tweet" what they're up to (or what they're thinking about) in 140 characters or less. Smith was also banned from making any travel plans more than three days in advance and has to leave each location within 48 hours of arriving. In his latest updates, he reveals a battle with sea sickness on the crossing to Stewart Island. "Oh god, I'm rocking back and forth. Still got motion sickness. Curse you, Stewart Island! "Yesterday's ferry crossing was calm according to local, but it managed to turn me inside out."